I just returned to Aguascalientes (literally, I walked through my house’s door less than 10 minutes ago) from a gruelling, one-day field trip. A good friend of mine from the Universidad Autonoma Metropolitana Xochimilco (UAM-X) had invited me to join her, one of her PhD students, and two other professors on a trip to three small municipalities in northern Zacatecas. We are all interested in doing work with communities affected by mining activities, from various perspectives. 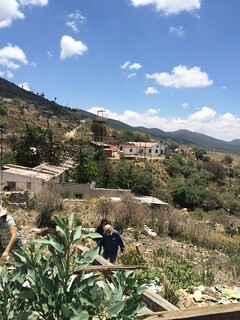 Having had a fantastic experience undertaking fieldwork with Dr. Jaime Hoogesteger from Wageningen Universitaet last fall in San Miguel Allende, I’ve always felt that going on the field alongside fellow faculty from other universities allows me to see things and have questions answered that I probably wouldn’t have thought about otherwise. I jumped at the possibility, and thus I travelled to the city of Zacatecas on Thursday night to prepare for the one-day trip. I have to recognize that I was not prepared for what I saw, and the conversations I had, and the things I heard. I study marginalized individuals, vulnerable communities and the challenges that people who have no access to water, sanitation or energy face. Nevertheless, over the years and throughout my career, I had not entered a mine-centred community like the ones I visited yesterday and was not ready to see the complexities of a strange relationship between mining towns and the multinational corporations that allege being good corporate citizens but whose activities are highly polluting. I took courses in acid mine drainage and “Mining and the Environment” when I did my graduate coursework at The University of British Columbia. I am a chemical engineer who did his undergraduate degree in what used to be a colonial mining town and is now a world heritage city. My Mom did her Masters’ degree studying the politics surrounding the Canadian mining industry. I understand all the chemical processes necessary to extract minerals from ores. I know how to assess the negative environmental and human health impacts that mining can have on individuals and communities. Not my field of specialization, but I know a lot about it. A micro thread on the realities of fieldwork and how we demand too much from our peers. I spent 17 hours doing field research yesterday. And yet, despite all my expertise, I felt deeply unprepared for the eventualities associated with doing this fieldwork. I arrived late to my hotel in Zacatecas, after having dinner with one of my PhD students. We HAD to meet up as I wanted to hear how she was doing. Then, after dinner, I worked on a Revise-And-Resubmit and went to bed at 12:30am. As anybody who reads my blog or follows me on Twitter will know, my sleep time is usually 9pm. I woke up normally at 4:30am. I went to do fieldwork on four hours of sleep. Not by choice, by circumstances and happenstance. As I said on Twitter, I can’t reconcile the fact that we keep pushing faculty to do more, to write more, to publish more, to engage with the public more, to mentor more students, more, more, MORE, with the reality that we are human beings. …this newfound, emerging interest in dealing with issues of mental health in academia. We keep pushing our people to the brink. Even though I have a lot of training in research methods, ethnography, fieldwork, and I had already read Dr. Kimberly Theidon’s paper on doing fieldwork in conflict-afflicted zones, this particular field trip took me by surprise, and was a punch in the gut. It was also a humbling experience and a lesson for me. I’m an experienced fieldworker and ethnographer, and witnessing marginalized and impoverished people’s pain deeply affects me. But that’s the kind of research I love doing and I’m committed to continue doing it. It just so happens that the comparative public policy problems I look at and research are related to environmental issues, but ultimately my goal is to improve the lives of those at the margins, those who live in abject poverty and utter disenfranchisement. I’m not sure I’m the best person to provide suggestions on the best self-care strategies while doing challenging fieldwork but debriefing, taking time away from research and having a personal life have helped me cope with this work. And writing this blog post really helped me center exactly what I was concerned about: real attention to issues of mental health in academia needs to include an honest conversation around necessary changes to the way in which academia works. We need a more human and humane academia. I’m done hoping for it. I demand it. Tagged with field research, fieldwork, self-care.